The Southern Oregon Men’s Rugby Club lost to the University of Idaho 15-to-16 on March 26 at the Pacific Northwest Collegiate Playoffs in Tacoma, Wash. The University of Idaho scored early in the first half with a penalty kick to take a quick 0-to-3 lead. SOU stayed on the offensive and scored just minutes later to take the lead. Flanker Kala Haasenritter carried in the first try of the game and the first of his career off an assist from prop Jason Holt about 10 yards outside of the tryline. Flyhalf Mark Thorkelson was hurt on the play and had to leave the game after taking a shot to the left kidney. Thorkelson’s “golden boot” was missed for the rest of the game as the Raiders failed to make any of their kicks for points. As soon as play restarted after the try, SOU immediately pushed their opponents deep into their own territory and forced them to punt away possession. The ball got fumbled on its way to the punter and SOU’s Anthony Duchene dove onto the loose ball and carried it in for the score. Idaho closed off the first half with another successful penalty kick tightening the score to 10-to-6 after the first forty minutes. The second half started and the rain picked back up, leaving both teams at a stalemate for the first fifteen minutes of the second half. The action finally picked up when SOU lock Garret Haggerla broke through the front line of the Idaho defense, running the ball 50 yards down the field before finally being stopped. SOU captain Rocky Anderson was quick in pursuit behind Haggerla and was able to keep the play alive and took the ball in for the score to bump the SOU lead to 15-to-6. After the restart and the penalty, SOU kicked to put UofI back on their heels and try to capitalize on another mistake close to the goal. Idaho’s fullback retrieved the kick but called for a fair catch just seconds before he got smashed by Anderson. For the penalty, Anderson received a yellow card and was removed from play for 10 minutes and forced SOU to play down a man. Shortly after the yellow card, SOU scrum-half Josh Harris and Holt had to be removed from the game because of injuries. Idaho was able to exploit the numbers mismatch and scored two tries in the last 15 minutes of the game. SOU was unable to answer back once captain Anderson and two substitutes came onto the field in the final moments of the game. Idaho went on to play Western Oregon the next day in the Pac-Northwest Division II playoff. Harris and Holt received 9 staples in the side of the head and 13 stitches to a left eyelid, respectively. 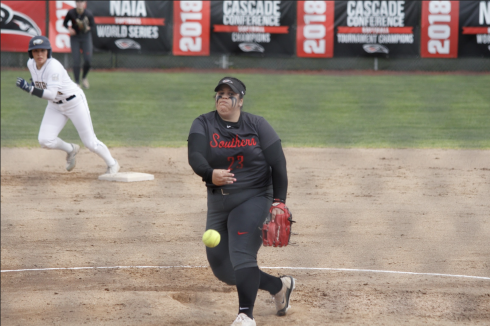 Southern Oregon has two games left in the season and will host Oregon Tech on April 23 before also hosting Southwestern Oregon Community College on May 7. An Alumni match is scheduled for May 28. Anthony Duchene is a member of the Southern Oregon University Rugby Club.